Robert Garff, left, and Gary Garff celebrate the opening of a Hyundai store. Ken Garff Automotive Group has 50 dealerships and is still growing. Ken Garff Automotive Group's foundation for success rests on the principles its late founder Ken Garff embodied: frugality with cash and generosity of spirit. "We are a growth company, not a dividend company," said Robert Garff, chairman of Garff Enterprises in Salt Lake City. "The money was kept inside the business. We had cash to expand and we were able to buy up some of our competitors." And while the acquisitions turned the company into a megadealership group, its true success rests in its culture, which adheres to Ken Garff's tenet that employees and customers must be treated right. "We teach our employees that our business is based on trust and we are here to serve the public with honesty and integrity, caring about them and their cars," Garff said. Garff, 73, sums it up as, "We'd rather keep a customer happy than keep a thousand dollar bill." Auto group founder Ken Garff branched into other fields, but his love was the car business. Ken Garff Automotive Group, which Garff Enterprises owns, ranks No. 8 on the Automotive News list of the top 150 dealership groups based in the U.S., with retail sales of 71,703 new vehicles last year. The group earned $4.11 billion in revenue in 2015. It owns 50 dealerships and is due to acquire two more through two separate acquisitions set to close by summer's end, Garff said. That's a far cry from its humble roots when company founder and Garff's father, Ken Garff, worked as a gas station attendant in the early 1930s. Then, Ken Garff traveled to Chicago on his free time to buy used cars. He'd bring them to Salt Lake City to sell for a profit. He got to be so good at selling cars that he quit the gas station job and in 1932 he opened his first used-only dealership in downtown Salt Lake City. 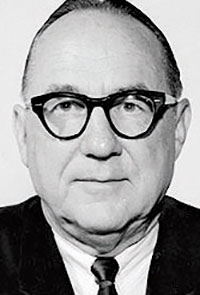 His first new-vehicle dealership was a Studebaker store that opened just before World War II. But with the U.S. entering the war in late 1941, many automakers shuttered car production. So Ken Garff closed his dealerships and became a cattle rancher in Utah. After the war, he got his first big break at being a franchised new-car dealer in 1946 when his parents mortgaged their home so he could acquire an Oldsmobile store in downtown Salt Lake City. From there, Ken Garff branched into other businesses including mobile home sales. He became one of the world's largest mobile home dealers during the 1950s. He also continued as a rancher, owning Deseret Livestock ranch in northern Utah and southern Wyoming where he had tens of thousands of cattle and sheep at various times until he sold it in 1975. But the car business was Ken Garff's true love until he died in 1997 at age 90. To ensure that the company would remain family owned, Ken Garff started estate planning for his three children in the 1950s. In 1958, for example, he bought a Mercedes-Benz store for $20,000. He put $10,000 of its stock in Robert's name and the other half in his other son, Gary's, name. Robert Garff was still in high school then and Gary Garff, seven years Robert's senior, was working for the company. "My dad did not stress we had to do this or that for a living, but he enticed us toward the automobile business by taking us to various auto shows and the NADA convention," said Garff. "My father was very wise. He said, "Son, what do you want to do?' I had to have a passion." By the mid-1960s Robert had found his passion in the family business alongside his brother and a younger sister, Jane, both of whom he'd eventually buy out. 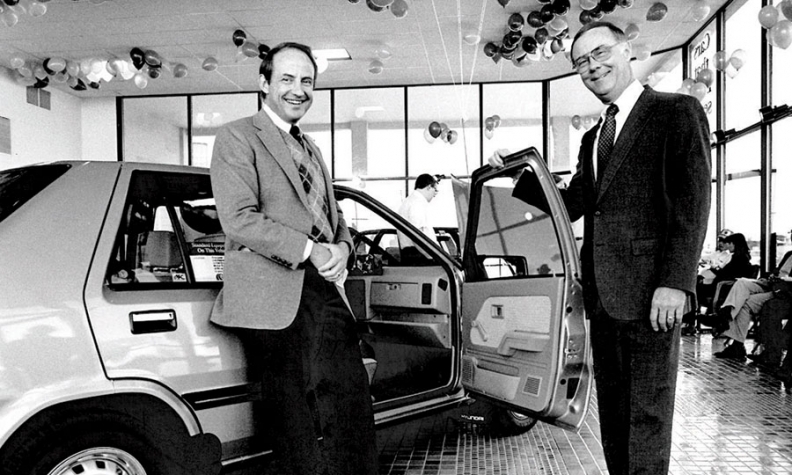 In 1972, Honda awarded the Garffs a new point in Salt Lake City, adding to their empire that sold Oldsmobile and Mercedes. In the late 1980s, the Garffs started buying other stores in Utah resulting in 10 franchises and annual revenue of $150 million by the early 1990s, Garff said. In 2006, Ken Garff Automotive Group began a huge growth spurt. That's when it partnered with Leucadia National Corp., a public investment company sometimes described as a mini version of Warren Buffett's Berkshire Hathaway. The partnership helped Garff grow to 50 stores from 20. Today, Garff's son, John Garff, 48, is CEO of Garff Enterprises. Garff's other son, Matthew Garff, 41, is senior vice president of the company focusing on all real-estate transactions. His daughter, Jennifer Folkerson, 50, is an administrative assistant to the executive team. Folkerson's husband, Rick, 52, is in charge of the company's community outreach program focusing on literacy. Like his father, Garff has been careful to do thorough succession planning with his children, giving them equal stock in the company and operational roles, but still making sure they earn "market rates" in their compensation. "We don't overpay our own flesh and blood," Garff said. 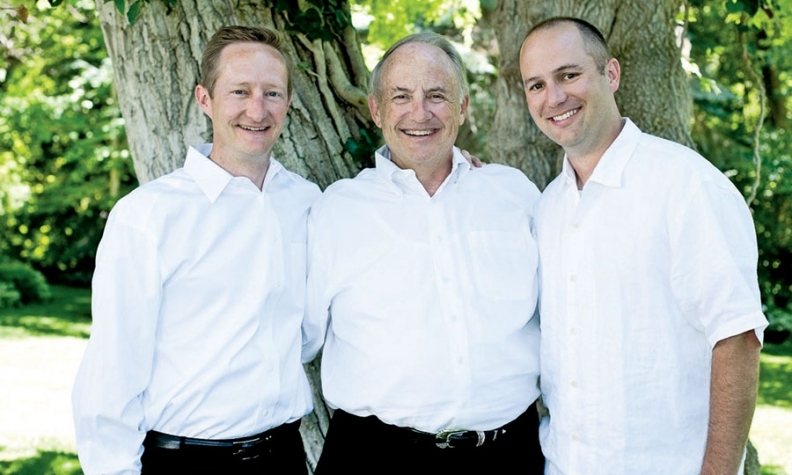 Robert Garff, center, is joined by his sons, John, left, and Matthew. Garff said he has an "understanding of a dollar" that comes from his father. Ken Garff was a child of the Great Depression. He taught his family the value of planning for the future by saving money and controlling costs, Garff said. "So when the opportunity came, he had cash to expand, when others didn't," Garff said. "My dad saved his dollars. He lived well below his means. I live well below my means and always have. I live on a salary that's relatively modest compared to my net worth. So do my children. They live realizing cash is king and that they must save." Ken Garff was frugal, but his character was generous. For example, in the mid-1970s, when Robert Garff was general manager of the auto group, a customer returned with a car that had 150,000 miles on it. The customer complained that something went wrong on the car. The warranty had expired 15 years prior. "My dad said, "We'll buy back your car for what you paid for it,'" Garff said. "I said, "Dad, we can't do that. If every customer came in and asked for that, we'd be out of business!' He said, "Charge it to my account.'" "Dad wanted to take care of customers and he believed in repeat business," Garff said. Similarly, Ken Garff took care of employees. Once, an employee had a stroke while vacationing in Yellowstone National Park in Wyoming. Ken Garff paid to charter a plane to bring the man back to a hospital in Salt Lake City. Recently, an employee with breast cancer needed a double mastectomy. Ken Garff Automotive held her job as she recovered whereas 11 other women in her recovery unit said their employers had fired them, Garff said. He said the family carries on his dad's legacy. "He'd do things on his own nickel because he cared about people," Garff said, choking back tears. "I still have people calling me today telling me about my father and he's been dead 20 years."